When starting a trip, usually the sense that you use more is the sight. We are looking forward to everything that surrounds us, and only when we relax and allow ourselves, we realize that sensory stimuli reach the new place for more channels than the visual. We believe that a stimulating place to be an exotic destination, with cultures totally different from ours … But one of the most challenging for my senses are not across the planet, but much closer. I’ve been lucky enough to get to the place we talked about the Mar. I think is not the same reach Naples by a conveyance that allows you to contemplate its spectacular bay, with Vesuvius on the horizon cut and Capri to other side. Naples overwhelms you sensually, not let a break. Is southern Italy and therefore is a place full of archetypes, where suddenly you see represented Italy in the films of Fellini with clothes hanging on ropes that go from side to side of the street. In Naples is prohibited relax, traffic rules have been broken, both by pedestrians and vehicles, crossing a busy street can become an adventure, passing vehicles behind and in front of the pedestrian, the advantage of this short opportunities, giving brief respite from traffic, to advance to the destination, which is in oposite side of the street, vehicles moving in the opposite direction down the street and suddenly throughout this morass, you come to a street where no traffic seems to be an atmosphere of village and not that of the second largest city in Italy. 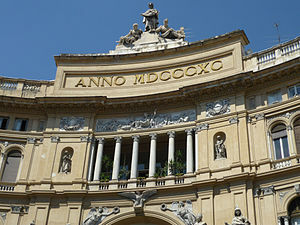 Naples and just so not only stimulates the eye but the ear, but here we really want to talk about the taste and possibly think that I want to mention pizza, of which Naples is the birth place, giving the name of the famous Pizza Margarita on in honor of the Queen of the same name as its composition carries the colors of the Italian flag. Red by tomato, mozzarella white, and green basil. But for me the most special moment of the day is when you get close to the Via Toledo to the Galleria Umberto I. Many people remember a similar one in Milan. Around mid-afternoon, the entry that is close to this street forms a tail that begins in a small bakery, “Sfogliatella Mary”. This is one of the places on the planet where you can discover the fifth taste, which the Japanese call umami. That feeling you get when you take a bath in hot water after a stressful day or when you try something exquisite and your throat get a aaaahhh!! characteristic. 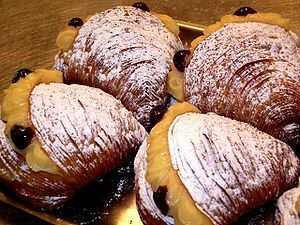 To feel the fifth taste it is best at this time of the evening, with my favorite pastry of Naples, the sfogliatella freshly made. Feel the crisp crust on contact with your teeth, and gradually feel the noise that makes the bite, feeling the warm custard caresses your palate, while notes feel vanilla, powdered sugar mixing with the taste of puff and feel that this aaahhh! out of your throat. As you can see traveling is not just seeing new places but feel new things. The Seven Wonders of the World, a collection of works of humanity that are at the magnificent man-made in antiquity. Aside from the fact that its classification corresponded Greek centric vision of the world when this classification was developed. It is less clear whether they have been part of the collective imagination. Number one are the Pyramids of Egypt, which is the only of them that remain standing, despite the depredations that have undergone throughout history. The others have disappeared and we have no reference or very few of them. For example of the Hanging Gardens for years doubted his existence, but modern excavations seem to confirm that they were actually built. To get an idea of ​​what were sometimes complicated, a representation in a currency of the time, the description of a contemporary author and of course there’s always the boundless imagination of cinema, although typically dedicated to the Pyramids, the Colossus of Rhodes. But today I would like us to stop at the Mausoleum of Halicarnassus (Halicarnassus was located in what today is known as Bodrum in Turkey). And it was the tomb of Mausolus Satrap (although some sources appears as King). Hence, from the time the graves they had a gorgeous and sumptuous, be known by the name of Mausoleum. The Mausoleum according to historical references he calculates a height of more than forty meters and endured the invasion of Alexander the Great, the Arabs … but an earthquake destroyed it in 1404. Like almost all the monuments that have fallen by earthquakes in the fifteenth century, and had endured standing over a thousand years is usually the reason was that the marble buildings were secured by metal pins. And a from the invention of modern guns much of that metal was used for artillery armies. Whereupon coming an earthquake and were a “loose stones” crumbling structure. Now if we get a composition of the awesomeness that was the Mausoleum from my personal experience, the best place is London. And specifically the British Museum. Many of you will be missed, but will devote some space to this in more detail later on the reasons for the prominence of the UK and London in particle in this aspect. Personally I recognize that London has an impressive network of museums, my favorite being the British Museum, even if I know I will be little time, I try to leave a gap in my schedule to visit some room. For me, if I take the subway, the easiest option is to get off at Totenmham Court Road, at the end of Oxford Street. Up North on Totemham Court Road and take the first right cross and go to the east, and walked about six minutes we find the main entrance of the British Museum.